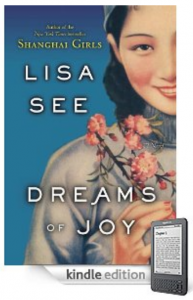 Lisa See, the author of one of my favorite books: Snow Flower and the Secret Fan, has released a new book that available for Kindle called Dreams of Joy. See’s latest book is said to be her best yet, and is one of the best books of June, 2011. Dreams of Joy is the sequel to Shanghai Girls, and follows the lives of sisters Pearl and May, and Pearl’s daughter Joy. Joy sets off to find her birth father, and the reader gets thrown into the midst of a poignant tale of tremendous love and suffering in the new Red China. Joy sets off for China after hearing of the new “utopian” society that has set in, only to be completely disappointed when she discovers the truth. I was shocked at some of the things that were confiscated under Mao’s rule. The regime felt that bras were oppressive and they were highly frowned upon. Which is quite ironic considering the foot binding that women are required to undergo. See describes the foot binding in great detail in Snow Flower. The reviews capture the essence of the story Dreams of Joy quite well. This entry was posted in Good Kindle Books At A Glance and tagged China, dreams of joy, lisa see, shanghai girls, snow flower and the secret fan by holly. Bookmark the permalink.